The FLPD 2019 Hardship Parking Permit FAQ is available to read by clicking here. Q: I want to park my vehicle overnight for up to 2 nights. Who do I call? A: You would call 201-794-5399 after 6pm. Handicap license plates and placards are exempt. Q: I need to park my car in a designated “No parking 8-10 am” zone due to construction, no room in my driveway, etc. Who do I call? A: You would call the police non-emergency number at 201-796-1400 as soon as possible prior to parking your vehicle. Q: I called my car into the overnight parking line and received a ticket for “No parking 8am-10am”. Why did I get a summons? A: These are two different lists and you MUST call both numbers to get permission. You must call 201-794-5399 for overnight parking and 201-796-1400 for 8-10am parking. Q: I need to park my vehicle in front of my house due to no space in my driveway (construction, too many cars for the driveway, child home from college etc.). How do I go about getting a hardship permit? A: If the parking issue is temporary (less than 14 days) you may come to the Police desk and get a parking pass. If the issue is longer you can purchase a hardship permit from the records bureau at a cost of $10.00 per month or $100 for the year. Q: Is my hardship parking permit good for anywhere in town? A: No. The parking permit that you receive is valid for in front of your residence. It is not good for different parts of town and you must obey the parking restrictions for that area. Q: I commute to the New York City and want to know where I can park? A: There are multiple places to park within the Borough. The train station parking areas (Erie, Upper Erie and Pollitt Dr.) have parking for residents and non-residents. These lots are managed by Parkmobile (www.parkmobile.com) or by downloading the application on your smartphone. The rates vary depending if you are a resident, non-resident or if you purchase a monthly permit. If you take a bus into New York City you may park in the Saddle River Road lot located at the Fair Lawn DPW yard at 20-05 Saddle River Road, and this is also governed by Parkmobile. Q: I have a home health aide that resides with me and they need to park in the street. What can they do to park in the street? A: You can come to Borough Hall and go to the Records Bureau (Room 106) and get a monthly permit for each aide that comes to the house. These must be renewed each month and are free of charge. Please bring in proof of the resident you are taking care of and your medical credentials. Q: There is someone that parks in front of my house and I don’t want them parked there. Can they do this? A: Unfortunately it is a public street so therefore they are allowed to park there, unless they are in violation of a parking restriction (ex. Overnight parking, 8-10am parking, parked in wrong direction etc.). Q: I saw someone commit a motor vehicle violation and I want them to receive a ticket. What can I do about that? A: You as a citizen may file a complaint with the court clerk, 201-794-5348. You must have a license plate in order to start the process of filing a complaint. Q: I have a complaint about cars speeding down my road. Who can I talk to for relief? 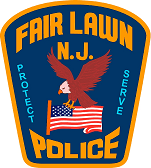 A: If you have a traffic concern in the Borough please e-mail traffic@fairlawnpd.com.